Caption slip reads: "Photographer: Mack. Date: 1960-08-13. Reporter: Slaten. Assignment: Marine Battln. to Camp Pendleton. Acting Gunnery Sgt. Helen Hannah with her kit and Lance Corporal Jay Hecker with duffel bag. 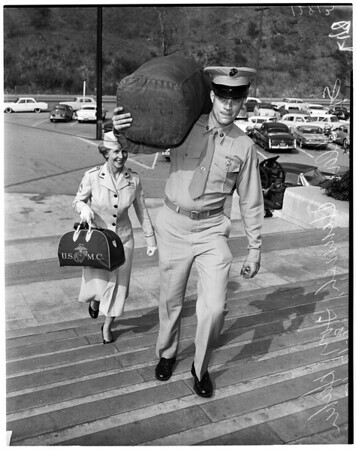 Gen. views of Marines leaving for Pendleton".